Creekside Cabin is an absolute GEM! Every detail has been well thought out to ensure this property surrounds you with all the comforts of home. Creekside Cabin has been meticulously and lovingly cared for… and you will notice this once you start down the beautifully landscaped drive and arrive at your home away from home. 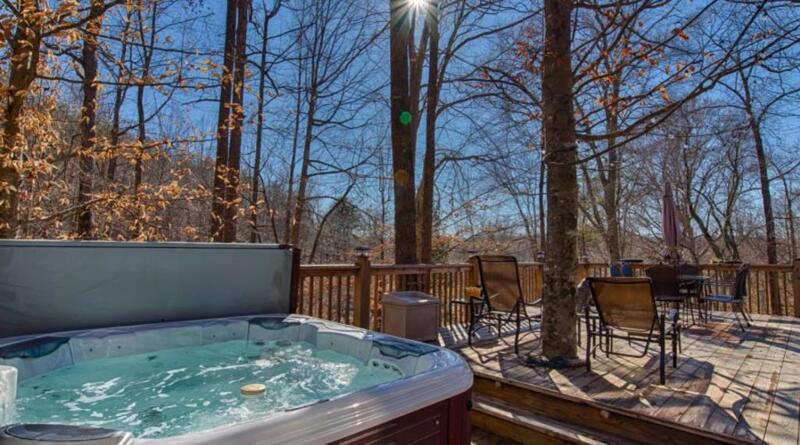 Expansive decks and outdoor living spaces are perfect for enjoying the Carolina seasons. Take a hike up the backyard trail that leads to a mountain top with beautiful views. Or enjoy a book beside the winding stream. Plenty of outdoor space for the kids to roam around while you relax in a hammock! Raining or too hot to be outside? No problem! Walk down to the adjacent park and cool off in the Green River. Or enjoy the one of several nicely furnished living areas in inside. This is truly the most accommodating cabin you will find! 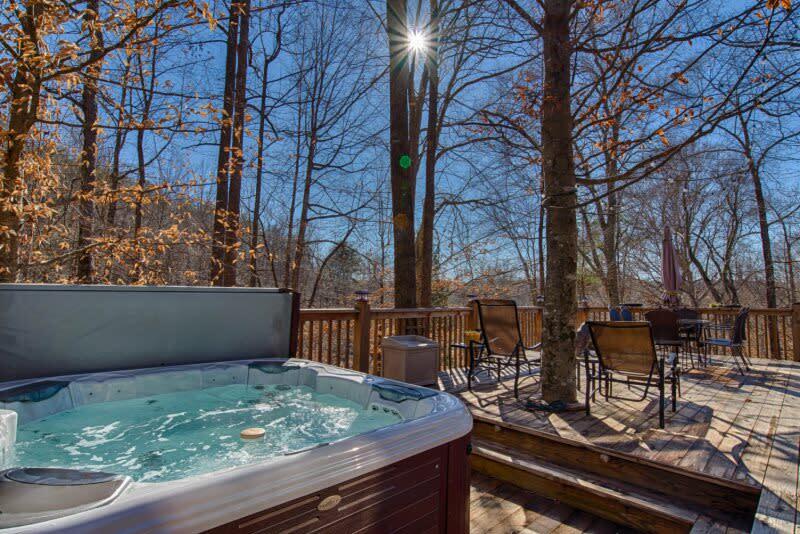 Whether you are looking for a true mountain escape with all the modern conveniences, or attending a Tryon horse show, there is something for everyone at Creekside Cabin. Conveniently located in a gated neighborhood less than 5 minutes from the Tryon Equestrian Center. The cabin offers 4 bedrooms plus a bunk room. It can easily accommodate two separate families as the lower level offers one bedroom plus the bunk room, an efficiency kitchen, family room with HDTV/DVD, laundry room and full bathroom. The main level has another family room with stone hearth wood stove, master bedroom and bath, and kitchen/dining area. Satellite televisions on the main floor are provided in the master bedroom and kitchen. Premium Bluetooth Sound System available on main floor. The upper level has two bedrooms, a bathroom and open loft area with satellite TV/DVD/VCR and small office area with computer, fax and printer. The cabin itself is decorated in rustic elegant decor, beautiful Australian Cypress hardwood floors and stainless steel appliances. The covered front porch offers a small 9 in 1 game table and the large open deck offers a 6-8 person hot tub, two patio sets and wicker seating area. Warm up in front of a fire, relax in the log swing alongside the on-site creek, or read a good book in the hammock. Plenty of room for the children to run, play croquet or catch fireflies. Note: Cleaning fee will be increased to $250 for parties of 7 or more.